Every single day provides the opportunity to improve yourself and become a better person than you were yesterday. By adopting this mindset, you will most certainly make lasting positive impacts in your life. This attitude has helped me immensely over the years. I struggled with the throes of addiction throughout my youth. It was a crisis that nearly took my life. I decided to adopt healthy habits and rituals instead of continuing my path of self-destruction. Today, I am proudly 9 years sober. My body has gone through lots of changes and transformations ever since I made the decision to cut drinking and drugs out of my life for good. A full body detox during my addiction rehabilitation were both necessary for me when I was at the peak of my addiction. After that, one of the biggest keys to becoming sober was adopting a new mentality of positivity and self-improvement. I am constantly seeking out new ways to improve my quality of life. I also receive lots of joy from telling others about my discoveries. Helping others achieve greatness and improve both their physical and mental aspects is extremely rewarding for me. I’ve prepared a list below detailing 5 ways to become a more successful and energetic person. These are tips I have implemented in my own life that have provided great results. Have you ever been sleeping in bed, feeling comfortable and relaxed, when all of the sudden an intense alarm clock goes off and immediately ends your peacefulness? After that, you proceed to hit the snooze button anywhere from 3-10 times before actually getting out of bed? This most likely means you are not a morning person. It’s ok, many people struggle with this issue. 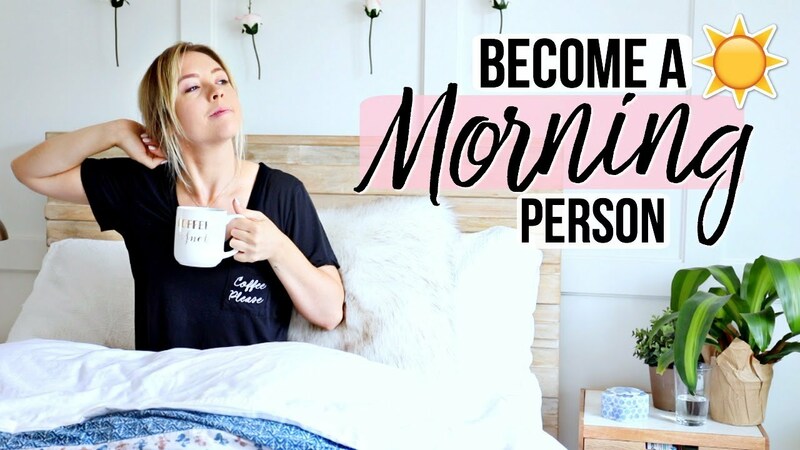 That being said, making an effort to become a morning person can provide you with energy that lasts throughout the day and also help to lead you on a path towards success. Becoming a morning person entails getting enough sleep. Ben Franklin once said, “early to bed and early to rise, makes a man healthy, wealthy, and wise”. I tend to agree with Ben here. When you provide yourself with ample time to sleep, you can perform better during your day and feel energized and fresh when you wake up, rather than like a sleep-deprived zombie. Hitting the snooze button can actually hinder your body’s energy flow and sleep patterns. Another crucial part of becoming a morning person is to establish a routine that you look forward to. This can include a cup of coffee, exercise, yoga, reading, or breakfast. Anything that motivates you to go to sleep earlier and to get out of bed and start your day is a step in the right direction. For me, exercise is one of the essential keys to success in my life. It’s something that helps me manage stress levels and stay focused. It’s probably the simplest form of self-improvement possible. All I have to do is commit to a period of exercise during the day, and I know for certain that I am bettering myself. Staying active can improve cognitive functioning through increased blood-flow to the brain, provide greater focus, and deliver higher energy levels. Getting into a routine can be difficult, but it is certainly worth the commitment and effort. Becoming a student of life means you are constantly hungry for knowledge and for new opportunities to learn. No matter what the subject matter is, you are consistently excited to discover new things. This attitude will serve you well throughout your life and provide countless opportunities for success. People rarely succeed on the first go at something. Learning from failures and seeking out new knowledge is the only path to success. Becoming an expert on a topic, skill, or field requires a relentless passion for obtaining new information and perspectives. Curiosity is essential to becoming successful. The old cliché “you are what you eat” exists for a reason. Eating certain types of food can have a serious impact on your health and energy levels. For example, simple carbohydrates that are found in sugary or processed foods provide a quick fix of energy right after you eat. However, you will experience a blood sugar spike and subsequent energy crash that leaves you feeling lethargic after eating those types of foods. By focusing on your diet, you can ensure that you are eating foods that are healthy and that provide consistently steady energy throughout the day instead of short spikes of energy followed by harsh crashes. Additionally, eating well can lead to improved confidence which is another key to success. If you are proud of your body and the way you look, this confidence will transfer into many other facets of your life. One of the hardest things that I struggle with is time management. Sometimes I feel like there simply aren’t enough hours in the day. I decided to really start focusing on what I spend my time on and it has changed my life. I am an entrepreneur, and I own a digital marketing company. After I designated specific time to work, exercise, sleep, and play, I started achieving my maximum productivity levels. Every day provides the opportunity to get better and to progress with your goals. If you don’t go into each day with a plan of attack, you might find yourself lost or unfocused. Becoming a more successful and energetic person will not happen overnight. It takes a conscious effort every single day of your life in order to progress. Each of the five tips detailed above will take you closer to a life of success and increased energy. By prioritizing sleep and becoming a morning person, your body will become energized and more productive. Staying active will boost energy levels and increase confidence. Always stay hungry for knowledge and take the “student of life” approach. Focusing on your diet and what you put into your body on a daily basis can directly impact your energy levels. Lastly, time management is a skill that is crucial on the path to success. What do you think is the most important way to become a more successful and energetic person? Have you achieved great results with any of the tips above? Please leave a comment below and let me know your thoughts!